Marketing Information: Hot swap with ease by installing four SSDs/HDDs into one 5.25in bay. 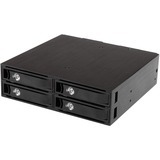 Now it's easy to drive share and enhance the storage capabilities of your server or PC. 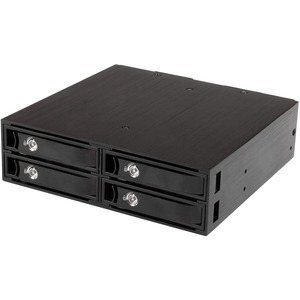 This mobile rack backplane lets you install four 2.5in SATA or SAS solid-state or hard disk drives into a single 5.25in bay and quickly hot swap them between systems. It's ideal for systems integrators and administrators who are looking for flexible management of their data storage. The backplane can be mounted either vertically or horizontally, for error-free tray insertion and maximum compatibility with servers or desktop computers.You can lock the removable steel trays in place, providing an enhanced level of drive protection. The Non-Scratch SATA (NSS) connector provides a high 50,000+ insertion rating, your assurance of long-lasting performance of both the drives and the bay.